Murder Trial Begins For Officer Who Drove Van In Freddie Gray Case : The Two-Way Officer Caesar Goodson, who faces the most serious charge related to Freddie Gray's death in 2015, heads to court in Baltimore on Thursday. Two trials of other officers ended without convictions. 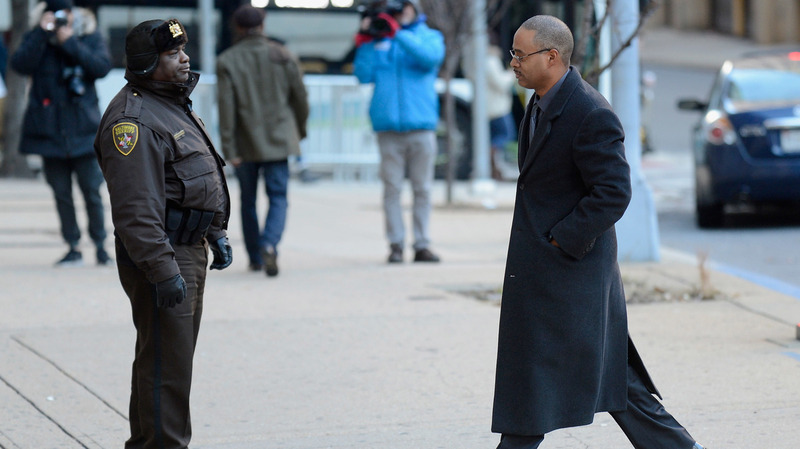 Baltimore police Officer Caesar Goodson (right) walks past Deputy Donald Rheubottom before entering a courthouse in Baltimore in January. Goodson, one of six Baltimore police officers charged in connection with the death of Freddie Gray, goes on trial starting Thursday. The third trial related to the death of Freddie Gray begins Thursday, as police Officer Caesar Goodson — who faces the most serious charge in the case — heads to court in Baltimore. Goodson drove the van in which Gray was transported after his arrest. Gray, a 25-year-old black man, suffered a fatal spine injury while in police custody — apparently while riding in the van, in shackles and not wearing a seat belt — and later died. As the driver of the van, Goodson faces charges including second-degree depraved-heart murder in Gray's death on April 19, 2015. "Goodson has chosen to be tried by a judge instead of a jury," NPR's Jennifer Ludden reports on Morning Edition. "He'll face up to 30 years in prison if convicted of murder. He's also pleaded not guilty to manslaughter, assault, misconduct in office and reckless endangerment." Steven Levin, a criminal defense lawyer and former prosecutor in Baltimore, tells Jennifer that Goodson is facing charges not for what he did, but what he didn't do — namely, failing to put Gray in a seat belt and render medical aid after his injury. Given that, "I think most people would be shocked if there's a murder conviction in this case," Levin said. Two previous cases related to Gray's death ended without convictions. The trial of Officer William Porter ended in a hung jury, while Officer Edward Nero was found not guilty. During both those trials, witnesses "testified that a van driver bears ultimate responsibility for a detainee," Jennifer reports. "Prosecutors may also try to prove that Goodson gave Gray a 'rough ride' — deliberately driving in a dangerous way — though it's not clear there's evidence of that," she says. One expert tells Jennifer that of the officers charged — six in total — Goodson's case may be the most likely to result in a conviction. "I don't know if he will get convicted; I don't know if he should get convicted," criminal justice professor Peter Moskos said. "But if anybody's going to get convicted, it'll be him." And if he isn't convicted? Jennifer reports it may prompt the state's attorney for the city of Baltimore to drop charges against the three officers still facing trial ... or may inspire protests across Baltimore. Two new developments shaped Goodson's case in the days before the trial. First, Jennifer reports, "Goodson's defense got a boost this week when the judge blocked key evidence from a police investigator. She had testified that another officer told her Gray said he couldn't breathe while he was in the transport van. The officer denied that; the judge deemed it hearsay." And then on Wednesday night, The Baltimore Sun reported that Judge Barry Williams will hold a hearing Thursday — the first day of the trial — to investigate "whether prosecutors wrongly withheld discussions they had with a potential witness." Goodson's attorneys have accused prosecutors of improperly disclosing evidence, and have asked for a dismissal of charges, the Sun reports.